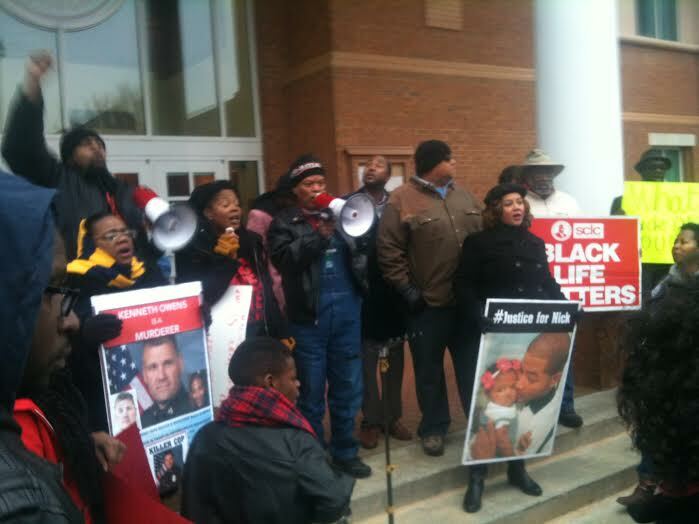 (APN) SMYRNA, Cobb County, Georgia — Smyrna City Council members fled their chamber when the family of Nick Thomas––an unarmed Black man killed by a Smyrna police officer––and at least one hundred supporters interrupted their meeting on Monday, February 15, 2016. Sgt. Kenneth Owens killed Thomas in March, 2015 while the young man was working at a Goodyear in Vinings. Owens had confronted Thomas with a warrant for violating probation and claimed Thomas tried to run him over with a car. An autopsy later showed Thomas was shot in the back, raising questions as to whether he was in fact advancing toward Owens when he was killed. Less than one year later, Sgt. Owens was scheduled for a promotion. “You go out and kill somebody and then you’re promoted… it just doesn’t look right,” Huey Thomas, the deceased man’s father, told reporters. “And these people sit up here like it’s just another day,” Thomas said of Smyrna City Council members. February 15, 2016, was the first day Owens’s promotion was effective, and the Smyrna City Council had plans to honor him. That apparently changed when a large crowd gathered outside of Smyrna City Hall with signs and chants calling for justice for Nick Thomas. The agenda did include a proclamation in recognition of Arbor Day and a brief performance in honor of Black History Month. Finally, in the middle of a zoning hearing, protesters had enough of being ignored: they erupted from their seats with cries of, “No more business as usual!” and surged toward the Council. As pandemonium set in and Councilmembers scurried out a side door, Nick Thomas’s mother, Felicia Thomas, took to the podium microphone. “Mr. Mayor, I see you are a coward today. You hear me? You are a coward! You massacred my son and then you have the doggone indecency to give Kenneth Owens a promotion,” she shouted. Protesters demanded that Owens be arrested and his promotion rescinded, that the federal government conduct a full investigation into the shooting, and that the evidence go before a special grand jury with a special prosecutor. A grand jury convened by Cobb District Attorney Vic Reynolds failed to return an indictment in July 2015. Shortly thereafter, a U.S. Attorney for the Northern District of Georgia agreed to conduct a separate investigation, which is ongoing. This criminal could have simply accepted the warrant and bailed out a few hours later. Instead he stole a high-powered car and used it to threaten the lives of the officers, customers and co-workers around him. If he had succeeded in getting onto the public roads, how many lives would he have endangered. This officer deserves a medal for stopping this potentially deadly situation before it escalated. When will we see a full, in depth, follow up story regarding this killing and the investigation? Please don’t let this story fade away. This killing was just so wrong! It would also be great if you did not publish inflammatory comments like the one above that called Nicholas Thomas a criminal who was endangering the lives of others. (Probably written by the killer cop himself.) Actually, Nicholas Thomas was in a customer’s car doing his job based on a work order ticket at that very minute. He was not stealing anything when he was shot in cold blood in the side and the back. (The cops fired six bullets through the passenger side windows.) He was not driving toward the policemen. No one was in danger. That is a lie. What is this, the “pre-crime” scenario where you kill someone just in case something might happen later on? Nick Thomas’ mother Felicia was right when she told the city council that they aren’t living on the plantation any more and they don’t have to shut up. What world are the city officials and Smyrna police living in that they can COLD BLOODEDLY!! murder a young person with his whole entire life before him!!? It really makes your blood boil. In our country right now we are going through a complete betrayal of We the People by police and city and county officials, and it needs to stop. Is anybody safe from the police? May God bless! the Nicholas Thomas family and Cajun Snorton, and her baby, who will now grow up without a father. And how ’bout that cop being given an award! Way to go! City of Smyrna and Officer Kenneth Owens (the shooter)! Hope you’re proud of yourself. Hey, go to work, get your cop buddies and a K-9 together, get everybody armed to the teeth, all psyched up and loaded for bear, and go shoot somebody who owes a few traffic tickets! All in a day’s work, right?